Director – Alex Proyas, Screenplay – Akiva Goldsman & Jeff Vintar, Story – Jeff Vintar, Suggested by the Book by Isaac Asimov, Producers – John Davis, Topher Dow, Wyck Godfrey & Laurence Mark, Photography – Simon Duggan, Music – Marco Beltrami, Visual Effects Supervisor – John Nelson, Visual Effects – Digital Domain (Supervisor – Erik Nash, Animation Supervisor – Andrew R. Jones), Pixel Magic (Supervisor – Raymond McIntyre Jr), Rainmaker (Supervisor – Dale Feay) & WETA Digital (Supervisors – Joe Letteri & Brian Van’Hul), Special Effects Supervisor – Mike Verzina, Production Design – Patrick Tatopoulos. Production Company – Andrew Davis Co/Laurence Mark/Overbrook Productions. Chicago in the year 2035, where the use of robots as human servants has become widespread. Police detective Dell Spooner is suspicious of robots, following an accident in which he lost an arm. His suspicion is constantly revealed as unfounded due to the fact that the robots are programmed with The Three Laws of Robotics, which require that they always obey any order given to them and never harm a human being. Spooner then receives a recorded call from Dr Alfred Lanning of the US Robotics corporation, the creator of the Three Laws, and rushes there to find that Lanning has fallen several stories to his death. Investigating, Spooner finds that Lanning’s death may not have been a suicide. He apprehends a robot that tries to flee from Lanning’s laboratory. Despite the idea being ridiculed by his captain, Spooner insists on interrogating the robot, finding that Lanning enhanced it to give it emotions. US Robotics CEO Lawrence Robertson insists on taking the robot away for demolition. Spooner continues to investigate, aided by robot psychologist Susan Calvin. As Spooner discovers that something sinister is going on at US Robotics, robots start defying their programming and make repeated attempts to kill him. Isaac Asimov (1920-92) is one of the great names in science-fiction literature. Indeed, Isaac Asimov’s name is almost invariably the one science-fiction author that comes to mind first among people who do not read science-fiction. Asimov was a prodigious writer and produced more than 400 books in his lifetime. The majority of these were not science-fiction but general knowledge books on almost any subject under the sun that Asimov chose to write about from science, maths, history and the origins of words, to annotated versions of the classics, Bible stories and even collections of dirty limericks. Born in Russia, the child of Jewish parents, Asimov became an immigrant to the USA at a young age. His publishing career began in the 1940s under John W. Campbell Jr, the influential editor of the science-fiction pulp magazine Astounding. Campbell regarded Asimov as a protégé and his influence saw the beginnings of Isaac Asimov’s two most famous series – the short stories Strange Playfellows (1940), which became the basis of the Robot books, and Foundation (1942), which became the basis of Asimov’s Foundation series. Although, the greatest story that Isaac Asimov produced during this time was probably Nightfall (1941), which is regarded as one of the genuine science-fiction classics, a story set on a world surrounded by six suns as it experiences nightfall for the first time in two thousand years. Isaac Asimov’s fame amongst the general public grew in the 1950s with the publication of his various short stories in collected book form – his robot stories being collected in I, Robot (1950) and The Rest of the Robots (1964) and publication of the Foundation trilogy (1951-3), as well as original works like The End of the Eternity (1955), The Caves of Steel (1957), The Naked Sun (1957), the latter two also being robot novels. In the 1960s, Asimov began to move away from science-fiction, despite occasional returns to the genre – especially The Gods Themselves (1972), his single best novel, and creation of the science-fiction magazine Isaac Asimov’s Science-Fiction Magazine (1977– ) – into an extraordinarily prodigious output of non-fiction books. The 1980s marked Isaac Asimov’s return to science-fiction proper in a series of overinflated novels that either expanded classic short stories or sequelised and tied all of his other works together in a unified universe. Isaac Asimov’s stories read less well today – the characterisation is wooden and often sexist – yet the one thing that does stand through is the beauty of his ideas. Asimov was a ferocious intellect and his books and stories are always works of ideas – his robot stories, more than anything, play like detective stories in problem-solving logic. Isaac Asimov had an uneven relationship with the media. He had several stories adapted for the British science-fiction anthology tv series Out of the Unknown (1965-71); acted as scientific advisor on Star Trek – The Motion Picture (1979); served as scientific advisor on the tv series Salvage 1 (1979); was hired by Harvey Weinstein to write the English-language script for the US release of the French animated film Gandahar/Light Years (1988); came up with the premise of the excellent but short-lived tv series Probe (1988); sold Nightfall to Roger Corman who made it into two cheap B-budget films, Nightfall (1988) and Nightfall (2000); and gave loose inspiration to the tv movie The Android Affair (1996). Asimov is also frequently misidentified as having written the classic science-fiction film Fantastic Voyage (1966) or that the film is based on his book (even the Internet Movie Database repeated this misnomer for many years), when in fact all that he wrote was the novelisation of the film. The only full-fledged Asimov adaptation on screens prior to I, Robot had been Chris Columbus’s excruciatingly bland Bicentennial Man (1999). Of course, numerous Isaac Asimov works have been mentioned as film projects over the years, including The End of Eternity and Asimov’s Lucky Starr juveniles. Foundation has often been mentioned as a film project but has defeated many, the problem largely being that it is not one story but a collection of several, spanning a vast period of galactic history. (It would make a fabulous mini-series some day). The most famous of these planned projects was an adaptation of I, Robot written by Harlan Ellison, which was for a time announced under director Irvin Kershner, director of The Empire Strikes Back (1980) circa 1980. The film never emerged and Harlan Ellison later serialised the script in Asimov’s and then published it in book form as I, Robot: The Illustrated Screenplay (1995). The Harlan Ellison script is highly regarded and is certainly more faithful to the book than this version. The problem with any film is that the book is not a single novel but a fixup composed of nine short stories. Harlan Ellison at least makes Susan Calvin into a more central character and tells several of the stories in a series of flashbacks. (There was also the hit album I, Robot (1978) from The Alan Parsons Project, loosely based on Asimov’s books. Subsequent to Asimov’s death in 1992, his estate authorised a series of novels set in the Robot universe). 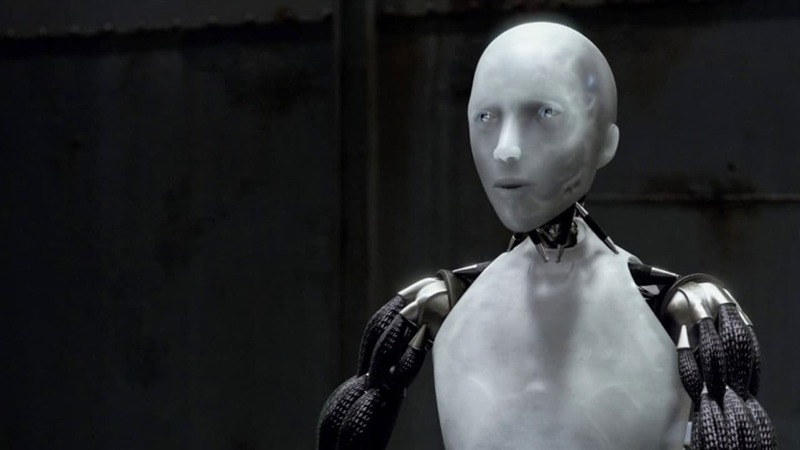 All of which brings us to I, Robot 2004. One approached the film with equal parts excitement and dismay. First there was the credit on the poster that informed us the film was merely “suggested by the book by Isaac Asimov.” Here one learns that the film originally began as a script for a movie named Hardwired, written by screenwriter Jeff Vintar, that was originally developed under Bryan Singer, director of X-Men (2000). The project was then taken on at 20th Century Fox who had acquired the rights to the Isaac Asimov book and requested that Jeff Vintar’s screenplay be retailored to fit the title of the book. Vintar had promisingly co-written the script for the excellent Final Fantasy: The Spirits Within (2001). However, the screenplay was then assigned to Akiva Goldsman for an overhaul, which made hopes for the project sink entirely. Goldsman may have won an Oscar for his adaptation of the blandly overrated A Beautiful Mind (2001) but elsewhere has created a trail of destruction whenever he has touched genre material as writer (or occasionally producer) of the likes of Batman Forever (1995), the unmentionable Batman & Robin (1997), Lost in Space (1998), Practical Magic (1998), Jonah Hex (2010), The Dark Tower (2017), Rings (2017) and the subsequent Will Smith genre films I Am Legend (2007) and Hancock (2008), as well as the terrible tv mini-series adaptation of another classic science-fiction novel, Arthur C. Clarke’s Childhood’s End (2015). (See below for Akiva Goldsman’s other films). On the other hand, one gained hope from the fact that in the director’s chair was Alex Proyas. The Egyptian-born, Australian resident Alex Proyas was a music video director who has first made the obscure arty post-holocaust film Spirits of the Air, Gremlins of the Clouds (1989) and then went onto the soaring screen adaptation of The Crow (1994) and Dark City (1998), which is probably the single finest science-fiction film of the 1990s. He followed I, Robot with Knowing (2009) about a time capsule that offers predictions of the future, and Gods of Egypt (2016). Mindedly, when it comes to adapting classic works of science-fiction literature, to Alex Proyas’s disfavour, he also lent his name as executive producer to the abortion made of Philip Jose Farmer’s books with the mini-series Riverworld (2003). Alas, there is disappointingly little of Isaac Asimov that ends up on screen in I, Robot. The film appropriates a number of Asimvovian names – the robot psychologist Susan Calvin, Alfred Lanning, the company US Robotics; while the famous Three Laws of Robotics are made into a central facet of the film – but the result is a far cry from any of Asimov’s robot stories. Crucially, Akiva Goldsman fails to understand what most of Asimov’s Robot stories were about. They were not big-budget action films, they were logic puzzles more akin to detective thrillers. Moreover, the reason that Isaac Asimov came up with the Three Laws of Robotics was that he was sick of cliché stories that frequented pulp science-fiction of the 1930s of robots going amok and turning on humanity – the Three Laws of Robotics were designed as a series of programming commands to keep robots as humanity’s servant, with the stories being about various problems that occur in interpretation of these laws. Akiva Goldsman fails to understand any of this. The story is certainly a whodunnit of sorts that travels along similar paths to Asimov’s Robot stories in asking how a robot that is programmed not to could kill, but the solution of the story is irrelevant to this programming dilemma. Moreover, I, Robot is exactly the type of robots amok story that Asimov set out to ensure that his stories were not – indeed, the film frequently and fragrantly defies the First Law, that a robot may not harm a human being – while the climax of the film trades in the dated clichés of amok AI’s and is all but a rehash of Colossus: The Forbin Project (1969) with an AI deciding that humanity has to be protected for its own good. I, Robot also comes made at a time when the present has rendered many of Isaac Asimov’s ideas obsolete. The film casually contains a number of presumptions about its future that did not even exist when Asimov was writing – the internet, nanotechnology, even the notion of a corporate conspiracy. Asimov wrote in the 1940s when the idea of a robot – of intelligent machinery taking anthropomorphic form – seemed a realistic extrapolation. In reality, automation and cybernetics have gone entirely the other way – non-anthropomorphic machinery in the form of the computer has skyrocketed, while robotics is left struggling with still trying to make a robot walk on two legs and be able to recognise patterns in order to see. The concept of a humaniform robot is generally regarded as being impractical in terms of design, with wheels and tractors usually being seen as more desirable forms of mobility. Any humanoid robot that ever comes out is more likely to be a design conceit than anything else. In artificial intelligence research, the fields of distributed intelligence and neural networking – ie. of intelligences evolving rather than simply being given a series of programming commands – is seen as being the more likely path than the Three Laws. (There have been a number of papers written as to why The Three Laws would not work in programming terms, which make for interesting reading). It is best to regard I, Robot as not being an Isaac Asimov film at all. On its own terms, I, Robot is passable science-fiction. The future presented is a disappointingly generic one, which the script does little to explore in any sociological depth. 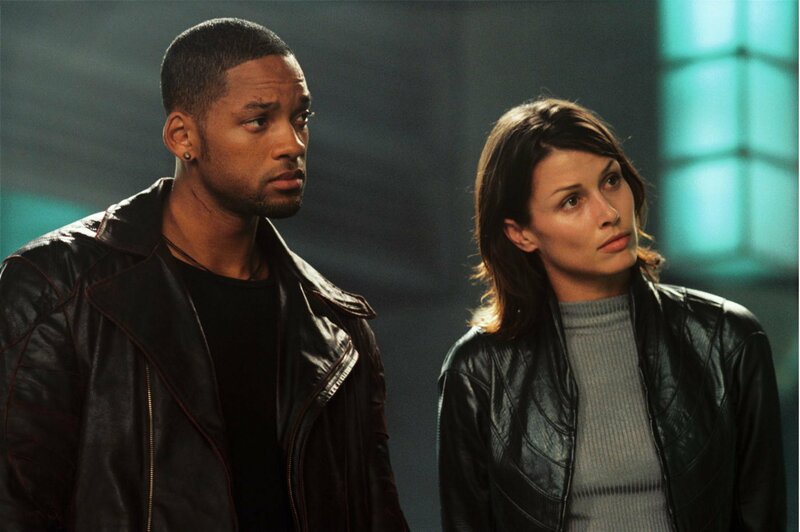 One of the film’s pluses is some spectacular effects set-pieces with robots attacking Will Smith’s car en masse while at high speed, and the climax with Smith and Bridget Moynahan scaling the tower complex as hundreds of robots come after them. However, there is the disappointing sense that the film is setting these up as spectacular set-pieces for the sake of it, rather than because the script demands it. The best scenes tend to be those where the film is not trying to be another big CGI effects spectacular. 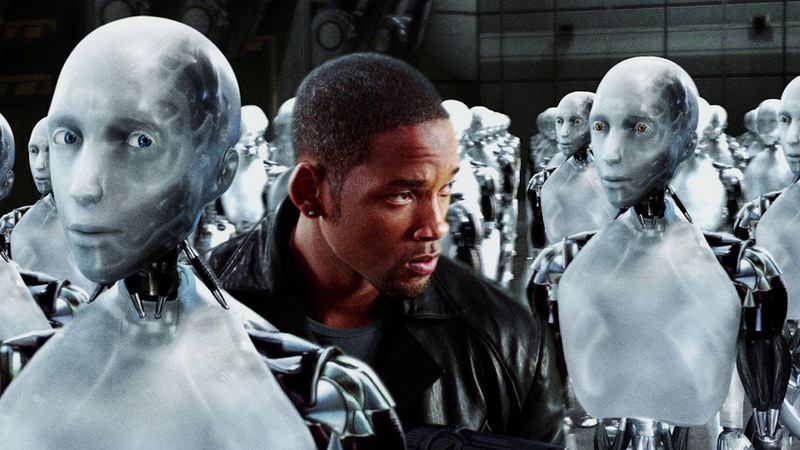 There is a fine sequence with Will Smith trying to locate Sonny while he is hiding in a robot factory amid 1000 other identical robots all lined up in geometric perfection. The CGI also does an excellent job in managing to project a series of perfectly human yet also very alien expressions on the face of Sonny. Beyond that, I, Robot has to be regarded as a disappointment. Akiva Goldsman has also written the scripts for the Joel Schumacher Batman films Batman Forever (1995) and Batman & Robin (1997), the big-screen remake of tv’s Lost in Space (1998), the witchcraft comedy Practical Magic (1998), the Oscar-winning A Beautiful Mind (2001), The Da Vinci Code (2006), I Am Legend (2007), Angels & Demons (2009), Insurgent (2015), The 5th Wave (2016), The Dark Tower (2017), Rings (2017) and Transformers: The Last Knight (2017). He made his directorial debut with the fantasy Winter’s Tale (2014), followed by the horror film Stephanie (2017). Akiva Goldsman has also produced another big screen tv series remake Starsky & Hutch (2004), Renny Harlin’s two genre outings Deep Blue Sea (1999) and Mindhunters (2004), the comic-book adaptation Constantine (2005), the paranormal investigators tv series Fringe (2008-13), the superhero film Hancock (2008), the supernatural Western comic-book adaptation Jonah Hex (2010), Paranormal Activity 2 (2010), Paranormal Activity 3 (2011), Paranormal Activity 4 (2012), the tv mini-series adaptation of Arthur C. Clarke’s Childhood’s End (2015), Guy Ritchie’s King Arthur: Legend of the Sword (2017) and the tv series’ Star Trek: Discovery (2017– ) and Titans (2018– ). (Nominee for Best Special Effects at this site’s Best of 2004 Awards. No. 8 on the SF, Horror & Fantasy Box-Office Top 10 of 2004 list).